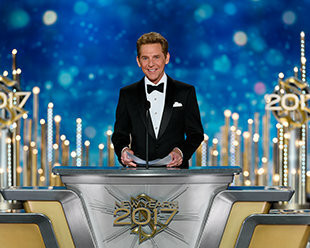 Mr. David Miscavige, Chairman of the Board Religious Technology Center, took the stage—signaling the start of a rousing Scientology New Year’s celebration for 2017. The Scientology New Year’s celebration at the Shrine Auditorium in Los Angeles commemorated a year of profound achievement and dramatic growth for the religion. Thousands of Scientologists and their guests gathered at the Shrine Auditorium in Los Angeles to acknowledge a year of stellar accomplishments and set their sights on 2017. Throughout Mr. Miscavige’s address, standing ovations rolled over the Shrine venue, each one underscoring another “win” for both Scientology and humanity at large. BRINGING PEACE TO THE HOOD L. Ron Hubbard’s common sense guide to better living, The Way to Happiness, was proliferated by Church members and friends at inner-city crisis points, thereby forging a gangland truce and reducing violent crime by forty percent. DRUG REHABILITATION PARTNERSHIP IN LATAM Narconon drug treatment programs for Latin America not only carried out continent-wide training of teams of specialists, but were also awarded official sponsorship and full support for any Narconon student in the Mexican State of Sonora. APPLIED SCHOLASTICS REVIVING AN EDUCATIONAL LANDSCAPE In Portland, Oregon, Mr. Hubbard’s learning breakthroughs sparked a resurgence in 21st century education and thus scholastic aptitude scores nearly 400 points above national averages. LIGHTING UP THE DESIGN WORLD The top luxury lighting design firm in the world employed L. Ron Hubbard’s administrative fundamentals to revolutionize chandelier design. SCALING GREAT HEIGHTS WITH LRH ADMINISTRATIVE TECHNOLOGY Among the WISE members featured at the Scientology New Year’s celebration was a leading Scandinavian roofing company named Swedish Craftsmen of the Year for two years running and which expanded 30 times since inception. SPARKING A NEW CULINARY GENERATION In Florence, Italy, an Italian chef academy combined L. Ron Hubbard’s administrative principles with culinary skills to graduate 2,700 expert chefs and now boasts a presence in 1,800 cafés, bistros and restaurants, including a number awarded with Michelin stars. REACHING HUMANITY ACROSS RUSSIA’S FRONTIER A team of Scientologists from St. Petersburg brought spiritual help to people across the nation’s 11 time zones. UPLIFTING ONE OF EUROPE’S YOUNGEST NATIONS The Scientology Mission of Levice, Slovakia, aided more than 10,000 with their Volunteer Ministers program, and provided over 4,000 drug education lectures, resulting in drug usage rates dropping by 50 percent. AN IDEAL MISSION FOR ORANGE COUNTY’S SOUTH COAST October 22 saw the dedication of the Ideal Mission of South Coast, which has expanded five times over. The Scientology New Year’s celebration capped a glorious year marked by unprecedented spiritual progress for parishioners and fantastic accomplishments for the religion. The New Year’s celebration saw a record number of Power Field Staff Members acknowledged for helping more than 100 ascend the Bridge to Total Freedom. As the joyous New Year’s celebration concluded a spectacular 2016 for the religion, Jazz legend Chick Corea led a chorus of voices to ring in a future of unlimited expansion and a 2017 of unbounded possibility. 03.13 A MAGICAL BIRTHDAY GALA ILLUMINATES THE LEGACY OF FOUNDER L. RON HUBBARD Thousands converge for the 2016 L. Ron Hubbard Birthday celebration in Clearwater, Florida. The occasion marks a dazzling weekend of celebration in honor of L. Ron Hubbard and his legacy. 04.02 ATLANTA’S SPIRIT OF FREEDOM SHINES BRIGHT The first Ideal Scientology Church for the South opens its doors in Atlanta, Georgia. 05.28 RELIGION’S MASSIVE COMMUNICATIONS HQ OPENS TO THE WORLD Scientology Media Productions is dedicated on a five-acre, technologically cutting-edge studio in Hollywood, California, from which the religion’s message will be proclaimed via television and radio broadcasting, Internet and social media and every other media platform. 06.11 FREEWINDS MAIDEN VOYAGE ANNIVERSARY HONORS UNFORGETTABLE 12 MONTHS FOR SCIENTOLOGY The 28th Anniversary celebration of the Freewinds Maiden Voyage casts off from the Caribbean port of Bridgetown, Barbados. 06.25 CHURCH TRANSFORMS TWO CLEARWATER BUILDINGS INTO MAGNIFICENT CITY LANDMARKS Two ribbons fall in unison to mark the transformation of a pair of city landmarks in Clearwater, Florida. The facilities form the administrative hub of the Church’s international spiritual headquarters. CHURCH COMING TO LIFE IN BUDAPEST An Ideal Church of Scientology Budapest opens, marking a milestone for spiritual freedom in Hungary. COMMUNITY CENTER OPENS IN HARLEM Harlem’s new Ideal Church of Scientology is called “a center of hope on 125th Street” in a stirring grand opening ceremony. FOR ASIA PACIFIC All new Asia Pacific spiritual headquarters is dedicated in grandest of ceremonies. The center stands amidst 900 acres of national forest in Sydney, Australia. 10.07 GRAND WEEKEND OF CELEBRATION HIGHLIGHTS MONUMENTAL YEAR OF IAS ACCOMPLISHMENT Scientologists and guests from 65 nations gather at Saint Hill, United Kingdom, for an anniversary celebration heralding 12 months of worldwide impact in the name of the International Association of Scientologists. 10.15 CHURCH OF SCIENTOLOGY CUTS A RIBBON ON NATIONAL AFFAIRS OFFICE IN THE EMERALD ISLE The new Church of Scientology National Affairs Office opens its doors in Dublin on the city’s iconic Merrion Square to offer permanent delivery of Scientology-supported social betterment programs in Ireland. 11.19 CALIFORNIA DREAMING BECOMES REALITY AS SAN DIEGO OPENS NEW CHURCH OF SCIENTOLOGY On a sunbaked afternoon in the downtown core, San Diego’s new Ideal Church of Scientology sheds her ribbon. The occasion held even greater significance as Scientology Founder L. Ron Hubbard spent his formative years in the city. As thousands of Scientologists and their guests assembled in Los Angeles’ Shrine Auditorium for the live Scientology New Year’s celebration, the filled-to-capacity hall was alive with excitement and anticipation. Behind—another record-breaking year surpassing all expectations. Ahead—relentless momentum destined to exceed all previous years. Mr. David Miscavige presented an overview of the year just passed encompassing a story of limitless expansion and achievement across every element and dynamic of the religion. And with that, Mr. Miscavige launched this year’s New Year’s celebration—an enthralling overview of 2016 told in terms of illustrative stories spanning 24,000 miles of the Scientology world. Throughout, standing ovations rolled over the Shrine venue, each underscoring another “win” for both Scientology and humanity at large. The presentation, complete with documentary footage of Scientology’s many humanitarian programs, provided a spellbinding overview of the religion’s astonishing expansion. Also featured were multitudes of those newly entering Churches and availing themselves of the spiritual technology of Scientology Founder L. Ron Hubbard (LRH). In illustration of exactly that, more than 10 times the number of Scientologists ascended the religion’s “Bridge to Total Freedom” in 2016 as compared to previous years. The April 2 inauguration of the first Ideal Scientology Church for the South in Atlanta, Georgia. The May 28 dedication in Hollywood, California of Scientology Media Productions—the five-acre, technologically cutting-edge studio, from which the religion’s message will be proclaimed via television and radio broadcasting, Internet, social media and every other media platform. The June 25 grand opening of a pair of city landmarks in Clearwater, Florida, forming the administrative hub of Scientology’s international spiritual headquarters. The July 23 consecration of an Ideal Church in Budapest, planting a milestone for spiritual freedom in Hungary. Just one week later, the July 31 launch of an Ideal Church and Community Center in Harlem, the cultural heart of Black America and enduring home of Spanish Harlem. The September 4 grand opening of an all-new spiritual headquarters and Ideal Advanced Organization for the Asia Pacific region, set amidst 900 acres of national forest in Sydney, Australia. And on October 15, the ribbon cutting of a Scientology National Affairs Office in Dublin’s iconic Merrion Square—a striking Georgian building for the permanent delivery of Scientology-supported social betterment programs in the Emerald Isle. Association for Better Living and Education (ABLE)—where secular and charitable programs employ life-changing strategies to overcome and eradicate drug addiction, illiteracy and crime. In Latin America, where Narconon drug treatment programs not only effected continent-wide training of teams of specialists, but were awarded official sponsorship and full support for any Narconon student in the Mexican state of Sonora. In Oregon, where L. Ron Hubbard’s learning breakthroughs sparked a resurgence in 21st century education and thus scholastic aptitude scores nearly 400 points above national averages. And in South Los Angeles, where L. Ron Hubbard’s common sense guide, The Way to Happiness, was proliferated by Church members and friends at inner-city crisis points, thereby forging a gang land truce and reducing violent crime by forty percent. World Institute of Scientology Enterprises (WISE)—Included in this year’s array of stories underscoring the efficacy of L. Ron Hubbard’s technology for prosperity is a Hungarian lighting design firm that revolutionized chandelier design. In the same vein is Scandinavia’s leading roofing company, named Swedish Craftsmen of the Year for two years running and which expanded 30 times since inception. And then there’s the Italian chef academy from which 2,700 elite chefs graduated for a culinary presence in 1,800 cafés, bistros and restaurants—a number of which boast Michelin stars. International Hubbard Ecclesiastical League of Pastors (I HELP) and Scientology Missions International (SMI)—The advanced guard of Scientology on behalf of humanity. Featured teams of SMI and I HELP, 2016, included Scientologists from St. Petersburg, Russia, bringing spiritual help to people across 11 time zones. In Slovakia, the Scientology Mission of Levice aided more than 10,000 with their national Volunteer Ministers program—a program providing more than 4,000 drug education lectures, reducing illicit consumption by 50 percent. Finally, there’s the Ideal Mission for Orange County’s South Coast in California, which opened its doors in October and has expanded five times over. Also honored were a record number of Power Field Staff Members, hailing from 37 nations. Each took the stage in recognition for helping more than 100 ascend the Bridge to Total Freedom. Finally, Mr. Miscavige presented yet another milestone achievement for the religion: the unveiling of the latest Ideal Org—the Church of Scientology of San Diego. It marked the 55th such “Ideal” facility and the fulfillment of L. Ron Hubbard’s vision of a Scientology Church as perfectly reflecting his technology. In a most appropriate summation of this Scientology New Year’s 2016, Mr. Miscavige reminded all present that, in these tumultuous times, what concerns mankind must, perforce, also concern Scientologists. “As you may or may not have noticed, the world out there is buffeted by contrary winds. But however else one views the current political climate, we are not political. We are Scientologists—and we stand for what LRH set forth in the Code of a Scientologist and the Creed of our Church. “Thus, we of the Church believe in human rights. We believe in racial equality. We believe in liberty, eternity and the dignity of Man. “And these things are not subject to political debate. In fact, these things are inviolate. So closed this Scientology New Year’s, 2016… And in that same spirit, so the Church begins 2017.